The Taper Roller Bearings are mainly used for supporting axial forces equally in both direction of bearing. Here, the inner and outer raceways are segments of cones and made with a taper so the conical surfaces of the raceways and roller would all meet at a common point on the main axis of the bearing.Available in pairs, these bearings are mainly used in construction, mining and agriculture industry. We provide them in all four major categories, which are single row, double row, and industrial row taper roller bearings. These are widely installed in cars, marine engines, light vehicles, agricultural equipment’s, steering etc. 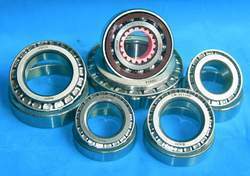 · Taper Roller Bearings - Inch Size : These are completely different from metric taper roller bearing; the inner ring with roller and cages assembly and the outer ring have individual designations. Taper Roller Bearings - MM Size : The designating of bearings is done as per the international standards. The metric bearings have normal tolerances standards. Looking for Tapper Roller Bearing ?